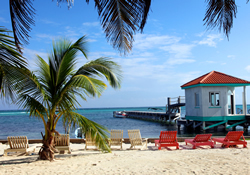 Belize may be a small country, but there’s still plenty to see and do.. Though many visitors simply come for a single location to fish or scuba at an island resort, the entire country is an easily accessible natural playground. Do yourself and your clients a favor a take a few moments to explore Belize and the many itineraries offered by Solar Tours who sponsors this article and makes your use of it in your own newsletters and websites possible. Sitting on the Caribbean coast between Mexico and Guatemala, Belize straddles North and South America. Only a few hours away from the United States by air, this English speaking country enjoys having some 40% of its landmass in a legally protected area. The main urban city is Belize City, but most people go to Belize for the out of doors attractions, not for nightlife. 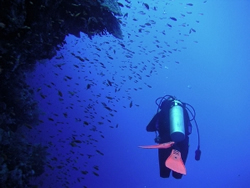 Snorkeling, diving, fishing bird watching, hiking and exploring the jungle are the main attractions here. The high season for tourism runs from late November to late April. The climate in Belize is subtropical and generally similar to that of the most southern areas of the United States. The rainy season runs from June to mid-November and the hurricane season generally runs from June to November. The diversity of plant and animal life is nearly unmatched. The jungle canopies are alive with birds and plants, monkeys and cover exotic hiking trails through the forest floor. The jungle hides the ruins of great Mayan cities from 1,000 BC. By 900 AD, most of the Mayan civilization has disappeared. Nearly 600 archaeologically significant sites have been found, and hundreds more are likely to exist. 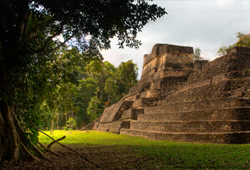 The largest known classic Mayan city to date, Caracol, is located in Belize. The barrier reef offshore is the longest in the Western Hemisphere at 175 miles. Belize’s most famous dive spot is the great “Blue Hole” a submerged cave some 100 feet in diameter that has collapsed on the ocean floor. The conservation movement in Belize goes back to the 1970’s when the Belize Audubon Society became the primary proponents for the Wildlife Protection and National Parks Systems Acts. The Aguacaliente Wildlife Sanctuary boasts more than 5,490 acres. The forest and savanna areas provide cover for a wide variety of animals including black howler monkeys, kinkajous and endangered tapirs and jaguar. The Belize Zoo and Tropical Education Center covers 29 acres of tropical savanna near the center of the country and with 125 native animals in residence. Many of the country’s native species are represented. The smallest national park is Guanacaste National Park. Easily accessible, Guanacaste is situated just outside the capital of Belmopan near the village of Roaring Creek and encompasses approximately 50 acres.